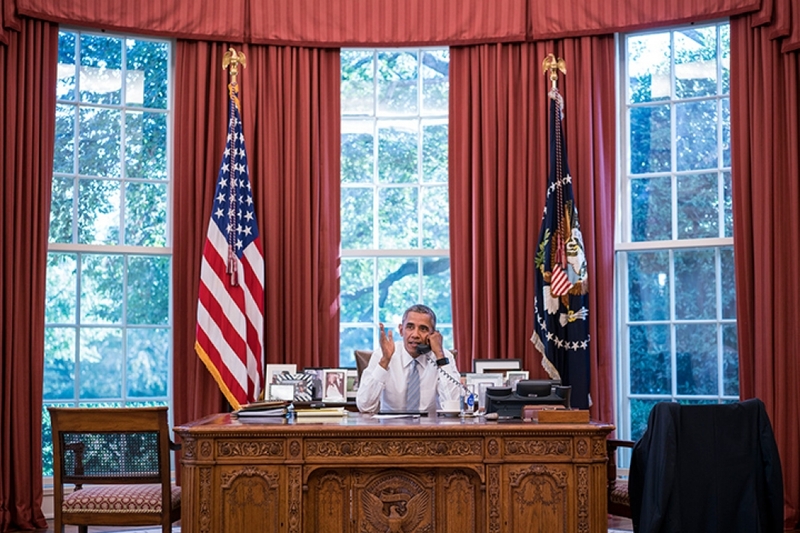 President Obama announced Friday morning that he has denied TransCanada’s permit application to build the Keystone XL oil pipeline in the U.S.
Barack Obama in the Oval Office. Obama said America is a global leader on taking action on climate change, and approving Keystone XL would have undercut that leadership. Some crude oil needs to be left in the ground to keep the climate from warming further, and rejecting Keystone XL will help meet that goal, he said. Among the reasons for rejecting Keystone XL, Obama said the pipeline would not make a meaningful long-term contribution to the U.S. economy, nor would it increase U.S. energy security or help to lower gas prices, which have already declined dramatically over the last year. TransCanada said in a statement that it “would review all of its options in light of a permit denial for Keystone XL,” including the possibility of filing a new permit application for a pipeline. “TransCanada and its shippers remain absolutely committed to building this important energy infrastructure project,” TransCanada CEO Russ Girling said in a statement. State Department officials said at a news conference Friday that TransCanada is free to apply for a new permit to build a cross-border pipeline and it is up to the company to do so. The $8 billion Keystone XL pipeline was slated to stretch 1,179 miles from east-central Alberta, Canada, to the Texas Gulf Coast. It would transport 830,000 barrels of crude oil per day from the Canadian tar sands to refineries near Houston. Proposed in 2008, the 875-mile section between the Canadian border and Steele City, Neb., needed State Department approval because it crossed an international border. Other parts of TransCanada’s Keystone Project between central Nebraska and Texas have already been built and are carrying tar sands oil to refineries along the Gulf Coast today. Environmental advocates have rallied against the unbuilt portion and urged the Obama administration to reject it, saying emissions from the production and burning of tar sands oil it would carry could worsen climate change. The U.S. Environmental Protection Agency calculated that the tar sands oil the pipeline would carry is highly damaging to the climate, emitting about 1.3 billion more tons of greenhouse emissions over the pipeline’s 50-year lifespan than if it were carrying conventional crude oil. The production of tar sands oil releases 17 percent more CO2 into the atmosphere than the average barrel of crude oil produced elsewhere, according to the State Department. An oil pipeline pumping station operated by TransCanada in rural Nebraska. State Department officials said that, internationally, approval or denial of Keystone XL would be seen as a test of U.S. resolve on global leadership on climate change, with approval of the pipeline likely seen as inconsistent with America’s pledges to reduce emissions. However, the officials said that crude oil production from the Canadian tar sands would not likely be reduced by the rejection of the Keystone XL permit. Only global oil prices and tar sands producers themselves will determine the level of production in the tar sands, they said. The Obama administration’s rejection of Keystone XL doesn’t mean Canadian tar sands won’t find their way to refineries. Energy companies mining the tar sands may have a range of options to get their crude to refineries on the Gulf Coast and elsewhere. Stephen R. Kelly, visiting professor of public policy at Duke University specializing in U.S.-Canada border issues, said that the rejection of Keystone XL will have little effect on the amount of oil flowing between the two countries because energy companies have already compensated by adding new rail capacity for oil shipping. 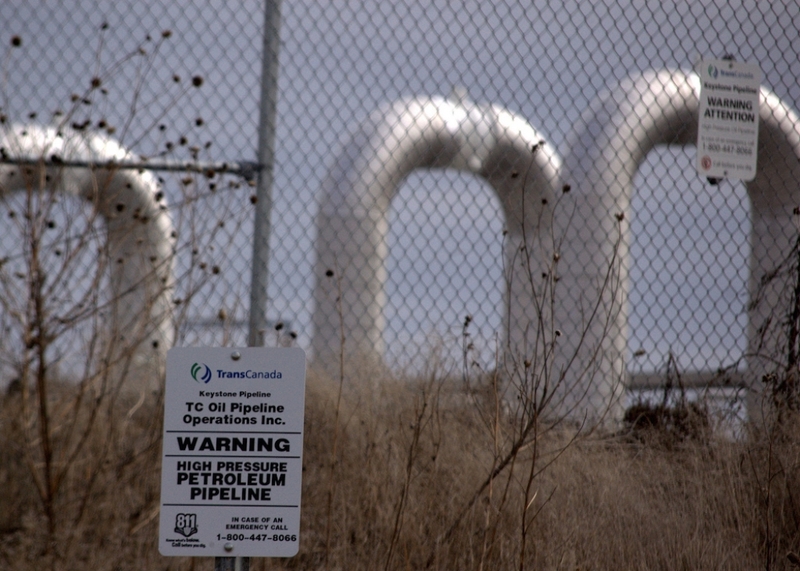 Within Canada, TransCanada is planning an even bigger pipeline project than Keystone XL. Starting in Hardisty, Alberta, the Energy East Project would carry more than 1 million barrels of tar sands oil per day to refineries in New Brunswick, though the company announced this week that the project has been paired down slightly. Energy East is slated to begin operating in 2018. Another proposed project is an expansion of an existing Enbridge Inc. pipeline in Wisconsin called the Line 61 Upgrade Project, which is being designed to carry 1.2 million barrels of crude oil per day from an oil terminal in northern Wisconsin to another terminal near Pontiac, Ill. Construction began in 2014, and the pipeline is expected to be operating at full capacity late this year. Enbridge just upgraded another pipeline called the Flanagan South Project that stretches from Pontiac to oil terminals in Cushing, Okla. There, Flanagan links to yet another new Enbridge pipeline expansion, called the Seaway Twin, which started carrying crude last fall from Cushing to refineries in Freeport, Texas. Energy companies are also using rail to transport crude from Alberta, and the Canadian government has approved other major Enbridge oil pipeline projects. Those include the Northern Gateway Project, which is slated to transport crude oil from Alberta to a port on Canada’s west coast, and the Line 9 expansion, which would pipe tar sands oil east to Montreal. How Safe Are America’s 2.5 Million Miles of Pipelines?